I am just popping in quickly today to share this avocado cilantro dressing / sauce / lover of my soul before heading out into the busy work day to do all those bloggery things that are so secretive and mysterious. What do bloggers even do, anyways? To tell you the truth, we primarily take naps and watch Netflix. No no no, I’m kidding. Don’t hate me. There are so many exciting and busy blog things going on right now – right now as in things I need to do TODAY – like working on a big writing and video project for a big brand (! ), meeting at the studio with the team who will help with our first ever food photography workshop in September (!! ), finalizing the new site design that will go live this fall (!!! ), attending a social sharing webinar about maximizing the potential of your images (🙋)… okay, the webinar is more of a I’m A Nerd statement, but still. You get it. Lots of things are happening. Fall energy is around the corner and I can feel it. So what to actually make for dinner when you have lots of good, exciting, and/or nerdy things going on (back to school rush, anyone?) and suddenly it’s 6pm – or in my case, 8pm, because I struggle – and you realize that you made no plans for food whatsoever but you and your people are bordering on dangerously hangry? Answer: put these seven things in your food processor and turn it on. The key here is Five Minute. Well, okay, fine – it’s actually a tie. You really need both the quick and easy and the flavor/texture components in order to be able to appreciate this dressing wonder. This dressing is my food life coming full circle during busy times of the year because it’s everything I love (I still find it hard to believe that there are some of you out there in the world who don’t like cilantro – are you guys all just LYING?) 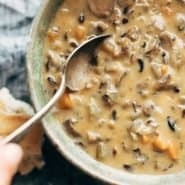 and better yet: it can go with, on, over, between, around, in, and under every other food that I love and/or might happen to find while cleaning out the fridge. Salads, roasted vegetables, rice bowls, chicken, you name it. This is a one-stop shop for an easy what’s-in-the-fridge dinner when you’ve got about two seconds until the collective hangryness in the house becomes all too real. In case you were thinking: isn’t this kind of like the Magic Green Sauce? Uh, hmmm. Gosh, how do I say this? Yes. Reeeally similar to the Magic Green Sauce in some regards. Also similar to that addictingly delicious sauce that goes on the slaw for the shrimp tacos. And pretty close to that healthy pesto I made here and another walnut pesto I made yesterday. How can you guys even read this blog? I’ve relegated it to one giant food diary about green sauces. I guess the difference between this and all the others is that this one – being that it’s a dressing – is tricked out specifically for drizzling over salads (and other stuff that you might happen to find needing a little extra zing). It’s your salad’s best friend. And if you and I are as food twinsies as I think we might be, it’s also going to be the best friend of your cilantro-avocado loving heart. I am in love with this dressing Lindsay!!! And your photography makes everything so gorgeous!! Hi Lindsay! This looks fabulous! What do you think I could sub for the greek yogurt? Hi, Tracey! Regular (plain) yogurt would work, as would sour cream. Enjoy! You had me at avocado. And cilantro. 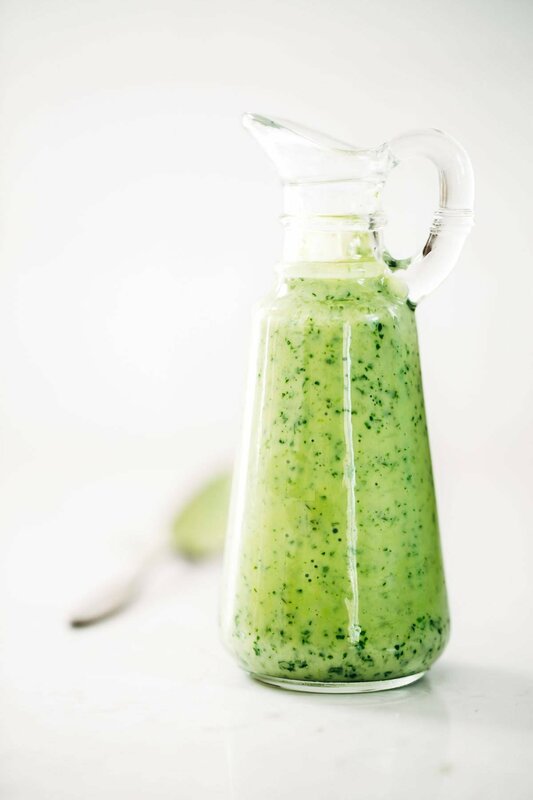 I love avocado dressing, I can’t wait to give your version a try! I would say my blender is the appliance I would choose if I could only have one or maybe it would be my hand held milk frother (is that even a word?) mornings just wouldn’t be the same without it! I already get that look from the cashier like…’she must own a restaurant’ …NOPE just us and our obsession with green things apparently. Sounds like you’ve got some SUPAH exciting stuff going on! Can’t wait to see it all! P.s Netflix is my life as a food blogger. WIN. 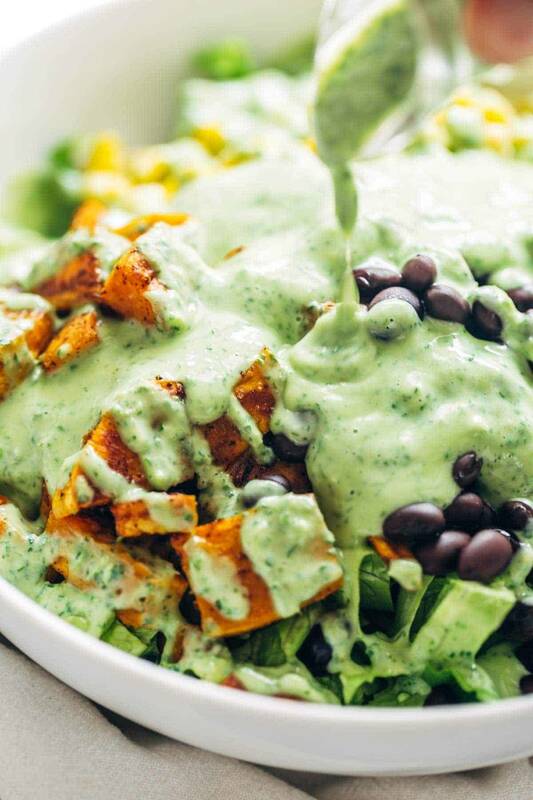 This avocado cilantro dressing looks so easy and tasty! And your photography makes everything so gorgeous!! Gorgeous!! In my opinion, you can never have too many delicious green sauces/dressings at your fingertips! I am a fellow cilantro lover so I’m alllll over this. In my opinion there can never be too much dressing or sauce, especially a green sauce. This looks delicious! I’m sure this is amazing on a salad but all I’m thinking about is dunking fresh-off-the-grill chicken into it. And then possibly just a spoon and eating it directly out of the bowl with NO SHAME! 5 minutes and all this deliciousness? I’m all in! Looks just perfect for salads, chicken, and maybe dipping! Exactly! Hope you enjoy it Kathy! I’ve eaten avocado in many salads before, but have yet to try avocado dressing. 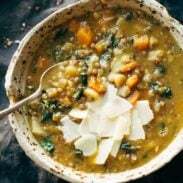 Yours looks so flavorful and delicious! I love all the ingredients. I can’t wait to try it. Hmmm, maybe tonight?! Hubby will be dancing the happy taste bud dance. Yesssss all the way! i will put this on boiled African Yams, fried Eggs, Pasta, Fried Plantain, MoinMoin… Yummy versatile sauce! Welldone. I’d like to say that I can’t wait to put this on a salad or bean burrito, but really what I want to do is bathe in it like people do with mud baths at spas. :). This has all the flavors I love! This dressing plus fish tacos equals perfection. Thanks!!! I have come pork chops that need to go on the grill tonight and some lettuce that needs used up… I have found what will tie it together for a quick dinner tonight. Thanks! This dressing looks yummy! I would rather make my own dressing than buy storebought anyday! The ingredients are fresh and there are no preservatives. Gorgeous. I LOVE the pitcher….any chance you have a link to finding this? That question was my thought exactly! I love beautiful things to put food in! I’ll have Lindsay get back to you on that!